Dr. Loftus is a widely recognized expert in the diagnosis and treatment of Crohn's disease. He has created an issue devoted the current state-of-the-art on Crohn's disease; authors have written comprehensive reviews on the latest research to inform clinical diagnosis and treatment. 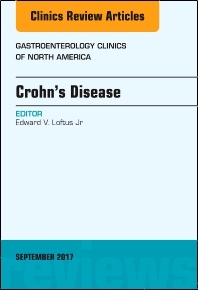 Articles are devoted to the following topics: Genetics; Epidemiology, natural history, and risk stratification of Crohn’s disease; The microbiome in Crohn’s disease: Role in pathogenesis and role of microbiome replacement therapies; Endoscopic and radiographic assessment of Crohn’s disease; Intestinal and non-intestinal cancer risk in Crohn’s disease; Sexuality, fertility, and pregnancy in Crohn’s disease; Interdisciplinary management of perianal Crohn’s disease; Targeting specific immunologic pathways in human inflammatory bowel disease; Evolution of treatment paradigms in Crohn’s disease; Preventing and managing postoperative recurrence of Crohn’s disease; Where and how to use anti-TNF agents and anti-integrins in Crohn’s disease; Ustekinumab and anti-interleukin-23 agents in Crohn’s disease; Update on therapeutic drug monitoring in Crohn’s disease; and Janus kinase antagonists and other novel small molecules for the treatment of Crohn’s disease. Readers will come away from this issue armed with the information they need to improve management of this disease as well as patient outcomes.